The most visually striking feature on Saturn’s icy moon Tethys is Odysseus crater. An enormous impact created the crater, which is about 280 miles (450 kilometers) across, with its ring of steep cliffs and the mountains that rise at its center. Odysseus is on the leading hemisphere of Tethys (1,071 kilometers, or 665 miles across). In this image, north on Tethys is up. This view is a composite of several images taken in visible light with the Cassini spacecraft narrow-angle camera on Aug. 17, 2015, at a distance of about 28,000 miles (44,500 kilometers) from Tethys. NASA's Cassini spacecraft took a peek at Saturn's moon Tethys and it looks like Tethys is capable of staring right back. A NASA image released, highlights the icy moon and its massive pupil-like crater. NASA notes that "a large impact not only created a crater known as Odysseus, but the rebound of the impact caused the mountainous peaks, named Scheria Montes, to form in the center of the crater." 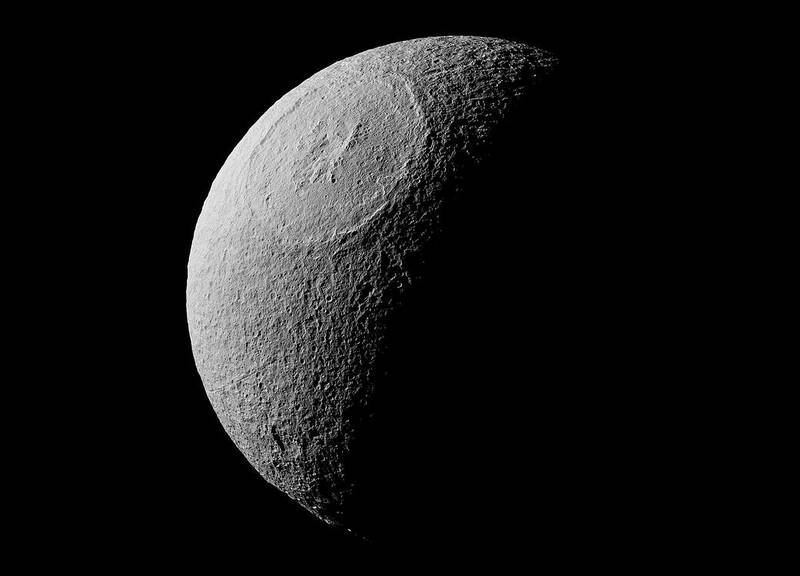 NASA photo of Saturn's moon Tethys is gaining notice for its resemblance to the Death Star in "Star Wars."